One of the most feared Chicago mobsters, Sam Giancana, clawed his way to the top of the Mafia hierarchy by starting as a hit man for Al Capone. He was known as one of the best vehicle escape artists, a tenacious business man, and a ruthless killer. He partied with major stars such as Frank Sinatra and Marilyn Monroe and did business with agents ranging from the CIA to the Vatican to the shah of Iran. When politician Joe Kennedy gave Giancana the chance to use mob muscle to get his son John elected, Giancana jumped at the task. But the Kennedy brothers double-crossed him, waging full-out war on organized crime throughout the United States. And Giancana went after them. Written with suspense and conviction, we learn about how the CIA asked Giancana to assassinate Fidel Castro. 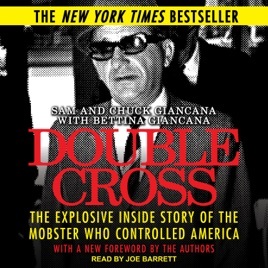 The book includes Giancana's testimony about the truth of his involvement in the deaths of Monroe and others, among others. Chuck Giancana, Sam's brother, contributes a unique perspective of the mob's relationship with the Bay of Pigs and many other pivotal events of the '60s and beyond. Double Cross is an eye-opening account of the interworking of the government and the mob and how this relationship has impacted American history.